What is the Gann Cancellation Policy? If you cancel your registration at least two weeks in advance of your seminar, you will be entitled to receive a full refund of the registration fee. If you cancel at least 7 days prior to the seminar date, you will receive a 50% refund of the registration fee. After that, no refunds will be given. You may always transfer your registration to another attorney. What is the Gann Financial Aid Policy? Attorneys reporting no annual household income in the previous tax year will be eligible to take that course free of charge. Attorneys reporting an annual household income of up to $35,000 in the previous tax year will be eligible for a 75% reduction in the fee for that course. Attorneys reporting an annual household income of $35,000 to $50,000 in the previous tax year will be eligible for a 50% reduction in the fee for that course. Attorneys reporting an annual household income above $50,000 are not eligible for any discount. Financial aid is limited to 6 credits in any calendar two-year period. Applications for such assistance must be supported by affidavit verifying the claimed levels of income. What are the Minimum System Requirements for the Webinars? If you do not have Adobe Flash Player installed for your browser, please click here to download it. How many credits may I earn through an Alternative Verifiable Learning Format (Webinars, Podcasts, Distance Learning etc.)? NJ: New Jersey attorneys are permitted to take up to one-half of their continuing legal education credit hours PER compliance period through courses offered in alternative verifiable learning formats. Alternative verifiable learning format courses shall mean any videotape, audiotape, remote place viewing or on-line internet computer presentations, satellite simulcast, teleconferencing, videoconferencing, internet computer self-study, or other type of remote learning format authorized by the Board. 201:3. Carryover. No more than a total of twelve credit hours may be carried over to a subsequent compliance period. 201:8. Alternative verifiable learning formats. Courses taken through alternative verifiable learning formats, if approved for CLE course accreditation, shall account for no more than twelve credit hours per compliance period. NY: Experienced attorneys may earn CLE credit by attending CLE courses offered in the traditional live classroom format, or in nontraditional formats such as audiotapes, videoconferences, online, etc., so long as the CLE Board has accredited the provider to offer the course in the particular format, or the course is eligible for credit under New York’s Approved Jurisdiction policy. Newly admitted attorneys, attorneys admitted to the New York State Bar two years or less, must complete at least 16 transitional CLE credit hours in each of the first two years of admission to the Bar. NOTE: Newly admitted NY attorneys are ineligible to receive NY CLE credit for completing "NJ Attorney Ethics 2010". PA: Lawyers have the option of applying four (4) credit hours per compliance year to their annual CLE requirement. Any credits earned via distance learning in excess of the four credit limit, will not carry over into the next compliance period. The four (4) credit limit on distance learning will end with the 2014 compliance period. Beginning with the 2015 compliance period, attorneys may complete up to six (6) credits of distance learning per compliance period. Any credits earned via distance learning in excess of the allotted credit limit, will not carry over into the next compliance period. How do I find my Attorney ID number? 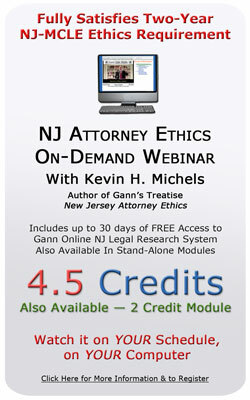 All attorneys in NJ have an ID number. Your Attorney ID number is nine digits in length, the last four being the year of admission. This number is shown on your attorney registration statement. You can obtain your Attorney ID Number by going to or www.njcourts.gov and clicking on Attorney Index on the left hand side of the screen under PUBLIC ACCESS RESOURCES or call NJ Lawyers' Fund for Client Protection (855) 533-3863. You may enter NJPENDING If you do not have an attorney ID for NJ and are applying for admission on motion.